It’s never pleasant to watch your dog struggle to move around. Whether caused by injury, disability, old age or surgery, many pets suffer from physical ailments that inhibit their mobility and full range of motion. Fortunately, there are a few options available that can help them get back on their feet and improve their quality of life. Among those options are lift harnesses and slings. Useful for pet owners, veterinarians and rehabilitation practitioners alike, a support harness provides a safe and effective way to help your furry friend get around without exerting pressure on its joints. It is a great solution for senior dogs, as well as those recovering from injury or surgery because it minimizes pain associated with walking, going up the stairs or sitting down. Read on to find out what symptoms and conditions may require the use of a dog harness, and to understand how it can help improve your dog’s mobility, recovery time and quality of life. Hip dysplasia occurs when a dog’s hip joint fails to develop properly, leading to a loss of cartilage which causes pain and reduced mobility. Dogs suffering from severe cases of ligament and joint issues can benefit greatly from the extra support a lift harness can offer. Accident-related injuries, ranging from sprained knees to broken bones or torn ligaments, can limit a dog’s strength and stability. The best harness for your dog will vary based on the type of injury. Most surgeries can leave dogs suffering from mobility issues in the post-recovery stage. A lift harness can help minimize pain and prevent muscle straining and fatigue. Arthritis is a common affliction which can be alleviated with the help of lift harness, used as a part of a multimodal approach for pain relief and to enhance mobility. Because senior dogs are more susceptible to multiple of the ailments listed above, the use of a lift harness may be especially beneficial for them. 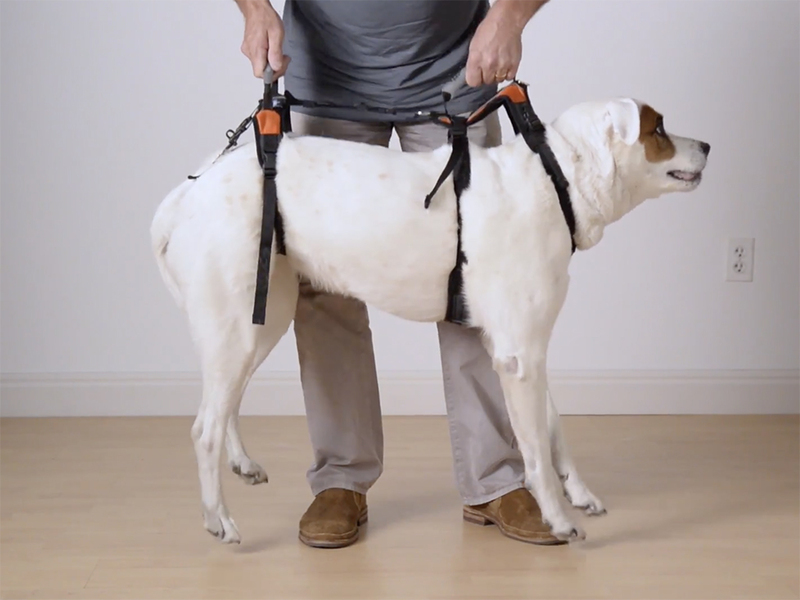 What are the benefits of using a lift harness for dogs? A lift harness is a sling designed to wrap around your dog’s body to support its limited mobility and help it get around more easily. The harness is equipped with a handle that you can pull up gently to take some pressure and weight off your dog’s legs, hips, spine or shoulders, or a combination of all four, according to the type of harness you choose (full body or dog rear lift harness). Minimizing pain and diminishing pressure exerted on muscles and joints when walking, going up the stairs or bending. Facilitating and speed post-surgical rehabilitation. Allowing you or your pet caregiver to maneuver larger dogs without having to lift their entire weight and possibly straining your back. Helping prevent injury to dogs suffering from overall leg and joint weaknesses. 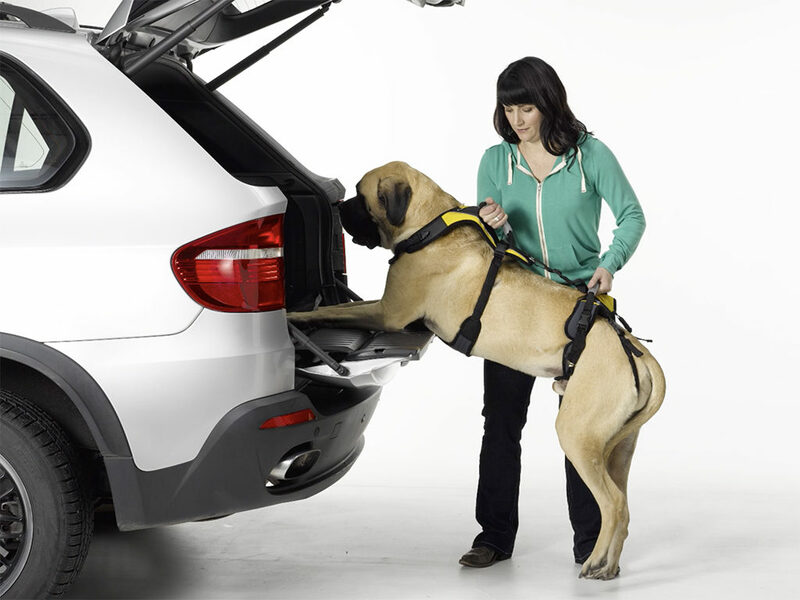 Providing comfort, stability and security to keep dogs calm while being carried/lifted. Now that we’ve established the reasons that may require the use of a harness and how they can enhance your pet’s quality of life, choosing the type that is best suited for your dog should not be overlooked. The type of harness you choose will depend on your dog’s physical ailment and where the injury/pain is stemming from. 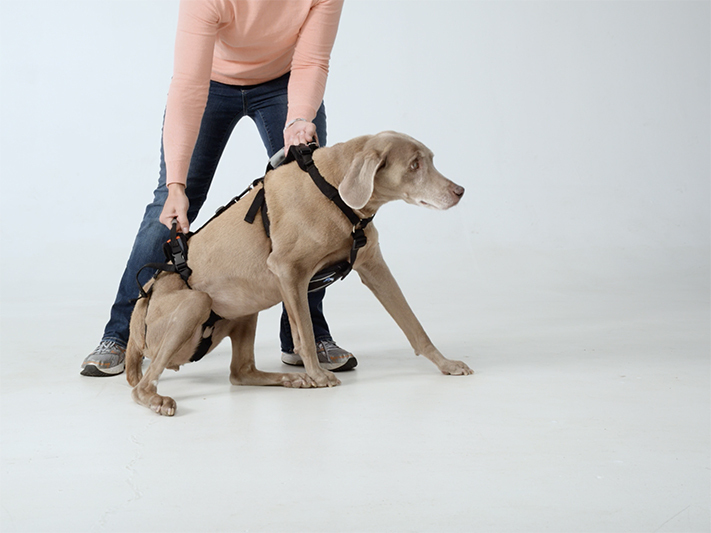 Dogs with mobility issues in their hips and hind legs should use a dog rear lift harness. Conversely, a full body dog lifting harness may be helpful if your dog suffers from overall joint pain, advanced arthritis or has undergone recent surgery. Opt for high quality, sturdy and flexible materials that will not irritate or cause friction against your dog’s skin (such as fleece or neoprene), especially when wearing it for extended periods of time. Consider options that feature additional padding and comfort-grip handles: the last thing you want is to get blisters or hand cramps while using the harness. You want a lift harness that supports your dog’s body without putting undue stress or pressure on its joints or muscles. The handle design is also important, as you’ll have to use a considerable amount of force to support large or heavy dogs. Before buying, the best way to determine if the design works is to consider your dog’s weight, shape and size. Ensure you get a lift harness of the proper size to ensure the sling securely supports your dog without exacerbating its injuries. 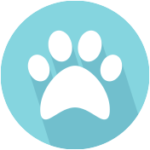 Consult sizing recommendations and get accurate measurements for your dog before making your purchase. Moreover, having adjustable straps will allow you to adjust their length to suit your own body. 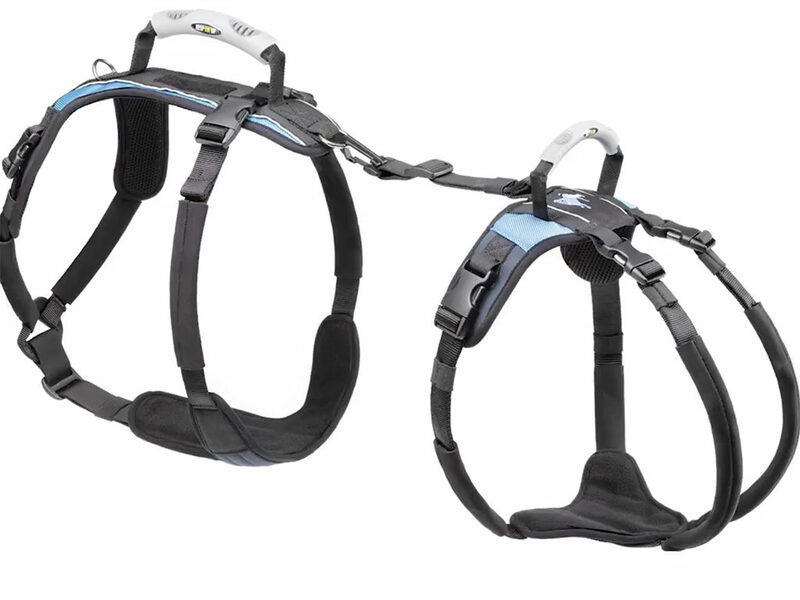 What we love about the Help’Em Up harnesses is that they don’t need to be removed or adjusted after each use. Their unique design lifts the dog’s mass from below, beneath the chest and pelvis thanks to the hip lift (not around the legs), distributing weight over large padded surfaces and reducing strain on joints, ligaments and arteries. The chest and back panels are lined with air flow materials and perforated neoprene to keep the harness cool and comfortable. In addition, areas subject to friction are covered with a super soft micro fleece fabric. The harness also features adjustable support straps and pivoting handles covered with neoprene sleeves so that the owner can loop them on or across his/her shoulders and maneuver them with utmost comfort. The Help’Em Up harness will assist your dog to walk, get in and out of vehicles, going up and down a flight of stairs and much more! Four Paws is happy to lend its customers a Help’Em Up harness free of charge prior to purchasing, to ensure both the owner and the dog are happy and comfortable with the product. Consult our health care practitioner for a free trial today! Just because your dog has limited mobility doesn’t mean that their quality of life has to be compromised. There is an array of rehabilitation devices and equipment available today designed specifically for incapacitated and mobility-challenged dogs. Consult a certified canine rehabilitation practitioner to determine if a dog harness is right for your dog, and if so, to assist in the proper use of the harness so you and your dog can continue to enjoy your afternoon walks together, pain-free.